There are many ways to hide a consultation. Say you're running a consultation for the extension of a Cycle Superhighway along Stratford High Street. You could organise just two consultation events. You could schedule both of these a fortnight after the initial buzz of the consultation period has faded away. You could locate one of these events in a metal box 500m away from the road in question. You could ensure that there are no signs advertising the consultation event posted on the exit from the main road or anywhere on the route to the venue. You could fail to stick signs anywhere on the exterior of the venue to announce the existence of the event. You could locate the group of project representatives on a table by the back door and only give some of them badges. You could ensure that the display pinned up on the wall has no legible title, so that regular visitors to this space would have no idea what was going on without asking. And you could accidentally schedule the event for a very snowy Sunday when a lot of people would be staying home. So it was with the consultation event that was held at the View Tube on Sunday afternoon. The pre-publicity was rather better, thankfully, because a leaflet announcing the event had been poked through my letterbox a couple of weeks previously. And rest assured you can't keep cyclists away from a consultation this important, so they turned up in number. The plans are to extend Cycle Superhighway 2 from the Bow Roundabout to the centre of Stratford. Newham Council blocked the progress of CS2 beyond Bow a couple of years back, saying they weren't happy with the plans. Everyone lambasted them at the time for not getting with the programme, but now it seems they might have the right idea after all. The first three miles from Aldgate got nothing but a cheap lick of paint and some minor rejigging, forcing cyclists to share lanes with other traffic and manoeuvre their way round umpteen bus stops. The last mile to Stratford gets segregated cycle lanes, speed tables, contra-flows, bus stop avoidance measures and a traffic signal bypass. It's an extension to be proud of, rather than the cheapskate tickbox exercise which runs past my front door. Full plans were available at the consultation event, including six pages of written detail and five A3 pages of maps. All in full colour, all on much glossier paper than my office is ever allowed to use, and all piled up in a box ready for potential distribution. You can find all this online, where the consultation is being hosted impeccably, but it's useful to have a physical copy when discussing the finer detail, and also for holding the planners to account afterwards. Let's ride from Bow roundabout to the Romford Road and see what's scheduled. Good, isn't it? Not perfect, but considerably closer to the Dutch ideal of full segregation than anything the Cycle Superhighway programme has churned out before. The London Cycling Campaign point out that 2m cycle lanes are wide enough for faster cyclists to overtake slower, which is good. They like the fact that cyclists will be taken out of conflicts with buses, and that space has been taken from the carriageway and not the pavement. It's mostly thumbs up from them. Cyclists In The City are impressed that TfL's design takes bits from Japan, bits from New York, and bits from Copenhagen and combines them to suit East London. They think that cyclists in other parts of town will be jealous not to have similar arrangements in their own neighbourhood. It's mostly thumbs up from them too. But this extension doesn't complete CS2, because that was originally intended to continue three miles further to Ilford. Carving a superhighway along the Romford Road will be much harder, and to this standard nigh impossible. Stratford High Street's super Cycle Superhighway is only possible because this is a massive road with surplus lanes and wide pavements, and the rest of London isn't like that. This is the ideal place to build a flagship project, but alas the blueprint is unlikely to be wholly transferable elsewhere without seriously inconveniencing other road users. And the CS2 extension will merely point out, through sharp contrast, how rubbish the remainder of the blue-striped route is. In particular it'll speed cyclists to the Bow Roundabout, where there remains a hideous disconnect. A number of the cyclists at Sunday's consultation remained very annoyed that this accident blackspot will remain essentially untamed, even after all the adjacent improvements have been made. There's a flyover for heaven's sake, surely that should be the ideal safe route for avoiding the roundabout altogether... if only there were some safe and sensible route on and off, which alas remains unlikely. I discovered from chatting to an official representative at the consultation that yet another scrutiny of the Bow Roundabout is planned, in a further attempt to keep as many groups of road users as safe as possible. TfL might even try to do something for pedestrians this time, although it's still not clear if anything simple and practical could be done. It seems that up until now the needs of motorists on the A12 have been paramount, because (apparently) it would be terrible if arterial traffic continually backed up on the sliproads. Alas there's been no such reluctance to cause tailbacks on the A11 or Stratford High Street, as I've noticed several times sitting in a bus queueing to slip through a miserably short eight seconds of green light. The situation at the Bow Roundabout will eventually get better, honest, although the money's not there for the ideal solution which would be to knock the whole thing down and replace it with a crossroads. In the meantime we have to acknowledge that Cycle Superhighway 2 is being completed piecemeal, and this latest piece along Stratford High Street is probably the best of the lot. 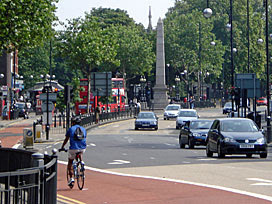 To take part in the consultation for the Cycle Superhighway 2 extension, head online. If you didn't take time to meet staff and tell them your thoughts in person, as some of us did, your only chance to be heard is to send electronic feedback by February 11th. If you want to see more Dutch-style segregated cycle facilities across London, now is not the time to sit back in the saddle.